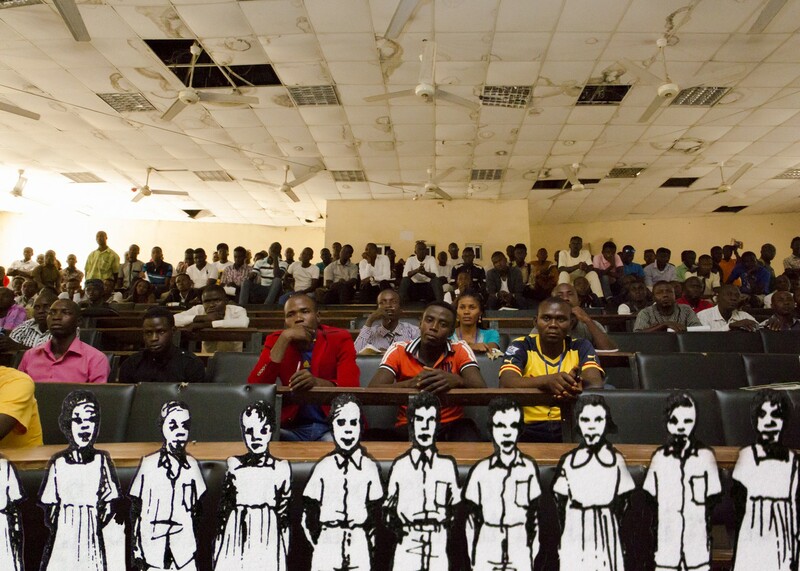 Students at a lecture with illustration from Nigerian school book, Mubi, Nigeria, 2015. For a few students it was instantaneous, like the blinking of an eye, sort of like the Rapture. Some compared it to the Second Coming, the very moment when Christ appeared resurrected. For many of the students of Adamawa State University who were on campus the day Boko Haram insurgents overran the town of Mubi, the event was more like The Exodus, when thousands of Israelites guided by a pillar of cloud by day and fire by night fled from Egypt towards the sea. But the timing was different, it was 2014, the setting was different, Mubi is located on the north-eastern edge of Nigeria and the people weren’t Israelites, but thousands of students and faculty fleeing the campus for safety. It was with this type of apocalyptic imagery that they remembered October 29, 2014, almost a year after the event. 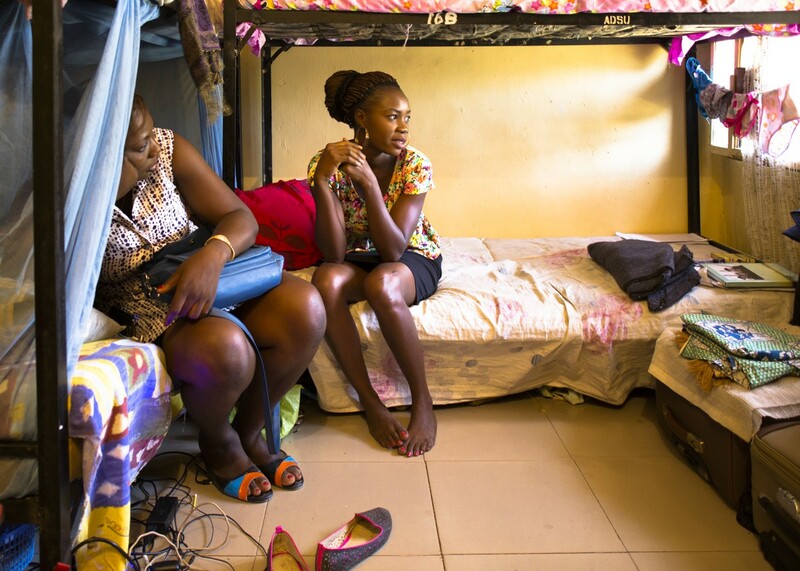 “We were just helpless” said Glory, 24, a third year Political Science student, as I interviewed her in the girl’s dormitories of the University. Glory had first observed the unhinging of the 29th at approximately 8am as she stood outside a lecture hall waiting for her professor to arrive. One by one, the students waiting around the hall began to trickle back towards the student hostels, as a rumour spread that Boko Haram were on a rampage in the town. At first, she thought it was funny the way her course mates were tripping over themselves, until she remembered the stutter of gunshots that disturbed their sleep the night before. By 9.30am, she could hear the sound of explosions. The ground was shaking so much that she thought bombs were dropping on the campus grounds. By then it was no joke. 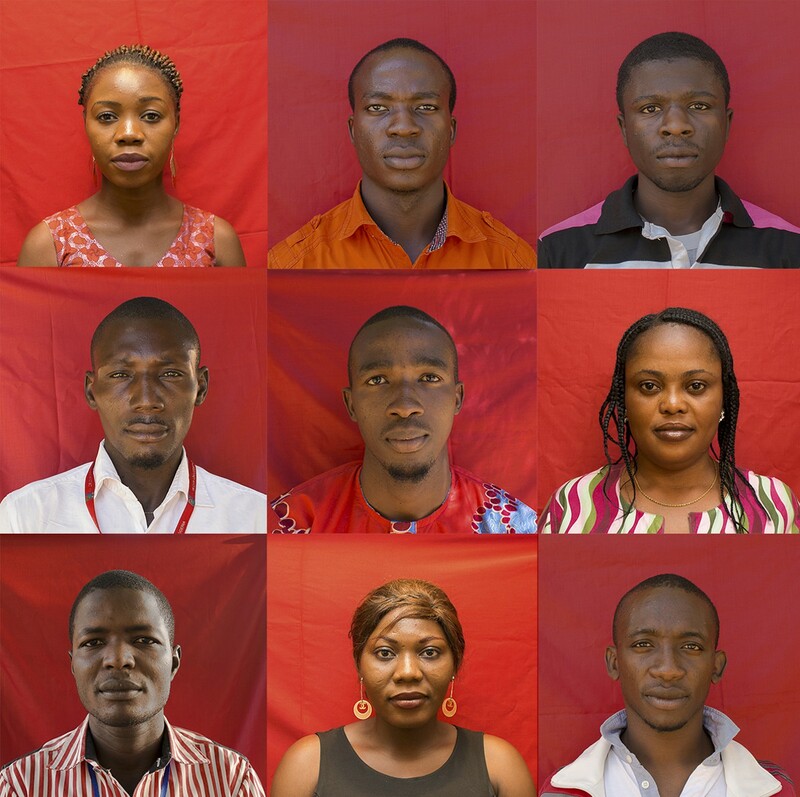 Portraits of Final year students at the university. Mubi, Nigeria, 2015. As I explored the university grounds with its modest cement structures and untamed grassland, attempting to piece together a narrative of the day, the students' surreal stories of escape and survival jarred with the quaintness of my surroundings. Adamawa State University was inaugurated with great pride in 2002, as one of three tertiary institutions founded by the government in Mubi. A few miles east and one could easily slip into Cameroon, a topographical secret that maps with their lines and borders belied but local Fulani herdsmen knew very well and had taken advantage of for hundreds of years, grazing their cattle on the vast Savannah. It was due to Mubi’s location that a bustling cattle market sprang up and with it a fledgling local economy of about 130,000 people. This made the town famous across West Africa as a prime location to buy and sell cows. The seven thousand students of the university studying subjects ranging from Economics to Animal Production had infused Mubi with a renewed purpose and buying power. The student body bought everything the town had to offer, beyond its livestock. So when the town was attacked in 2014, there was a real fear that the students would not return to resume their studies. 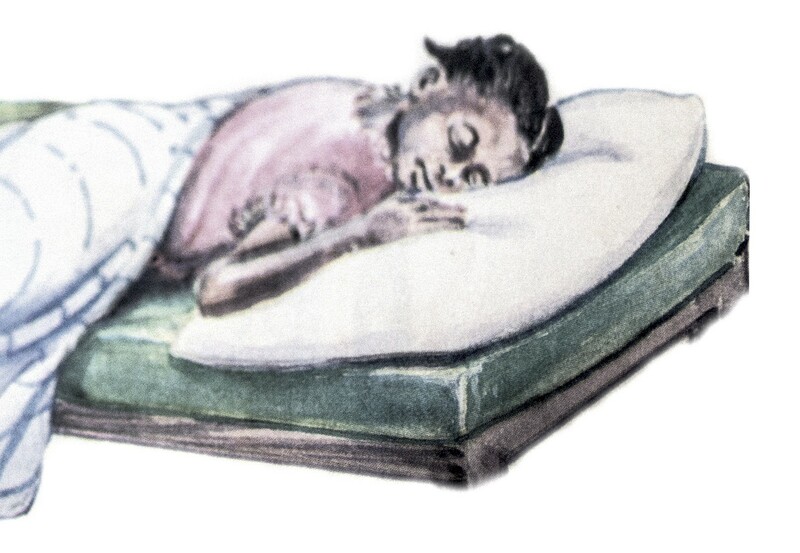 This left the hundreds of shops with goods like mattresses, school supplies and clothing specifically for young people, with no youth to buy them. Almost a year later, and to the relief of the townspeople, the lecture halls were filled to the brim. Ninety percent of the student body, according to university administrators, had returned to complete their degrees. On the surface it was as if nothing had happened. But with each interview, I peeled open a lid to the events of October 29, 2014 and saw that it had changed the students in the subtlest and most profound ways. Each conversation revealed tiny fissures and hairline fractures invisible to the human eye but lay belly up in the memories of the students of Adamawa state university who had been living in the forgotten spaces of a seven-year Boko Haram insurgency. In those seven years, students went to lectures, socialised, graduated and planned for the future, at the same time an extremist group with a target on their backs grew in size and voracity capturing towns and villages that tourist brochures may have described as a stone’s throw away. Throughout that time no one had really asked the students, how do you feel? It was chaotic in the girls' hostels that late morning of October 29, 2014. The compact room of two adjacent bunkbeds that I interviewed Glory in, was in disarray as the girls tried to gather whatever belongings they could. Some managed to stuff their certificates and a few other irreplaceable items in small bags chosen so they could effortlessly throw over their shoulders and run with ease. Frantic phone calls were made to friends and family hoping to find a way to Yola, the safer state capital as news spread that the insurgents weren’t outside the city as initially thought but within the town. Glory was lucky to squeeze into the back seat of a crowded car. She didn’t know it at the time, but she had just embarked on one of the toughest weeks of her life which formally began twenty minutes into the journey, when the car broke down. She would walk about thirty kilometres to the Cameroonian border. “Cameroon was just the beginning of our suffering, three days passed and immigration officials only gave us water,” said Glory who waited for days in a grassy field with thousands of displaced people from Nigeria. “They would call us for assemblies, bully and insult us,” she added, detailing the treatment she and other refugees received from Immigration officials who only spoke French and Fulani. 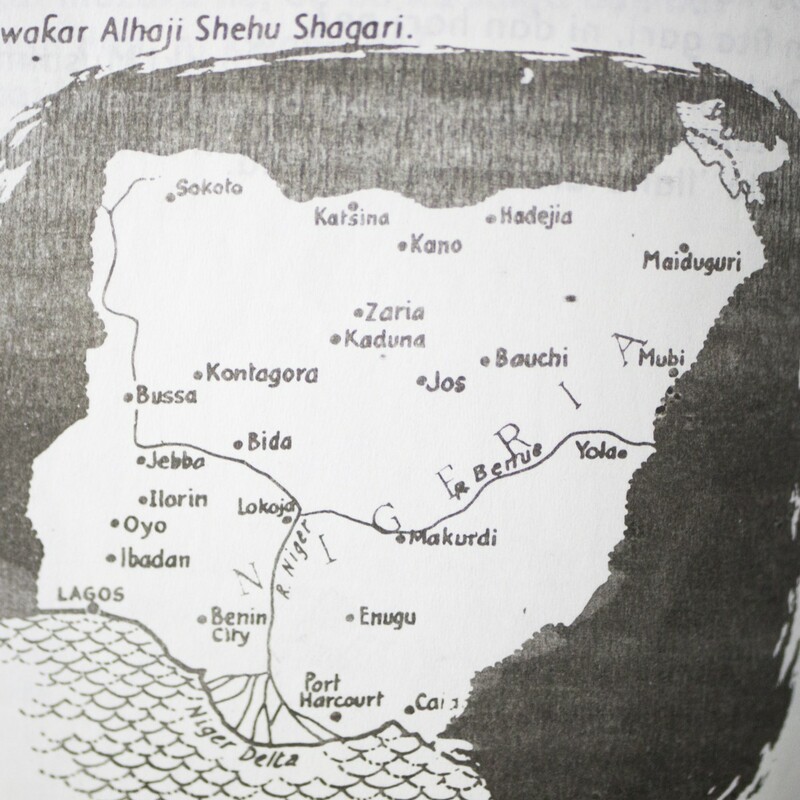 Illustration of an old map of Nigeria found in a Nigerian schoolbook. People had come to the Nigeria- Cameroonian border for safety from towns like Madagali, Bazza and Michika that had been recently attacked with Mubi. On the third day she managed to jump into a truck that was headed to Nigeria for three thousand Naira, the only cash she had. The truck went through bushes, valleys leaving behind the Mandara mountains, its dark silhouette marking the edge of the the Nigerian night sky. 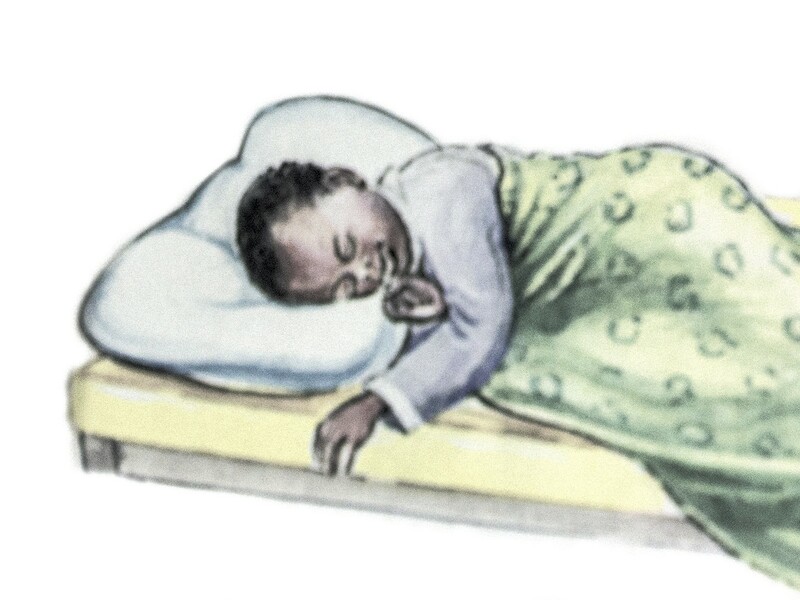 It took her a total of seven days to get to her family home in Yola. That was when she remembered her older brother, Christopher was missing. "I was totally confused, everybody was just rushing"
Christopher, 28, a second year student of Economics and Glory’s brother, was part of a group of seven young men racing to Yola after the university exodus on two motorbikes, when they nearly drove into masked Boko Haram gunmen who had blocked the road. “They asked us to stop, but we refused,” said Christopher who was seated at the back of the second motorbike when the gunmen began shooting at them. They were forced to kneel and strangely offered dried dates. He thinks this was an attempt by the gunmen to convert them to their cause. The three men kneeling in front of him refused to eat the dates and were shot. “They beat one and cut the other one’s neck” said Christopher about the other two men who died that day. He and a last companion escaped before the gunmen could get to them. After days of walking to a nearby town, he got a chance to call his sister. Glory screamed with shock when she heard Christopher’s voice. She had assumed he was dead. He had been gone for two weeks. 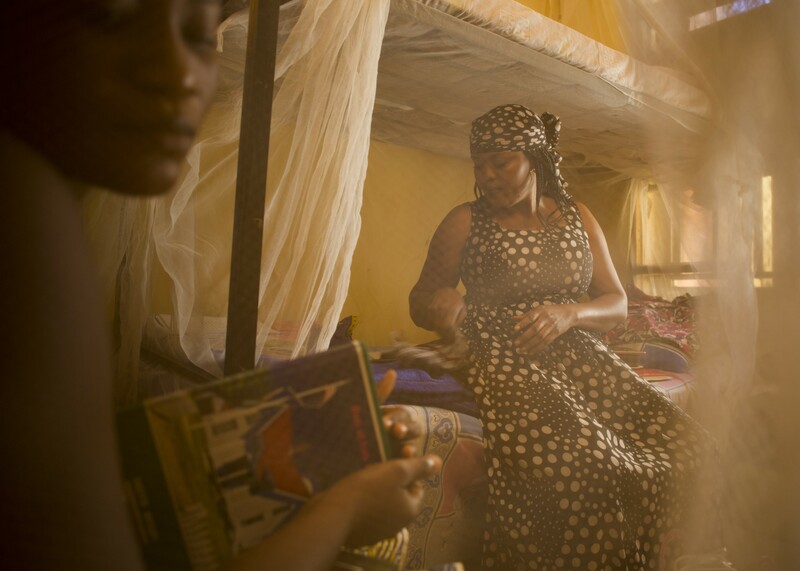 Winnie, 31, in her room in the girls hostels of Admawa State University, Mubi, Nigeria, 2015. The morning of October 29th began casually for Winnie, 31, a student of Political Science as she prepared for an 8am lecture. When panic ensued on campus, she made a different decision from Glory. Rather than join the flow of people leaving the town, she decided it was safer to stay on campus. But there was also another reason to stay. 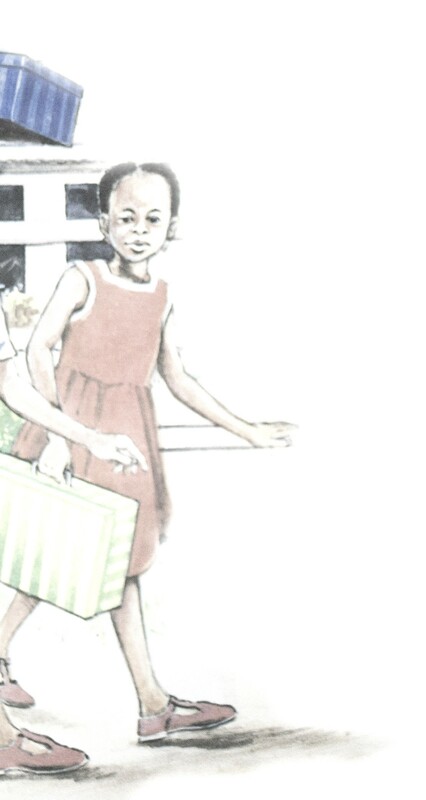 Earlier that day, she had separated from her younger brother Labaga. She was worried about his safety because he lived off campus, in a volatile area near the town prisons. In the last conversation with Labaga, she could barely hear his voice because he spoke in whispers. He was trapped in a bedroom with several people, afraid to leave because they could hear the gunmen outside. The sound of military jets flying over Winnie's hostel and the possibility that they may be aerial bombed, solidified her decision to leave Mubi, even without Labaga. She walked miles to a village where she squeezed into a car going to Yola. She was with her family that evening. She dialled Labaga’s number. It was unreachable. 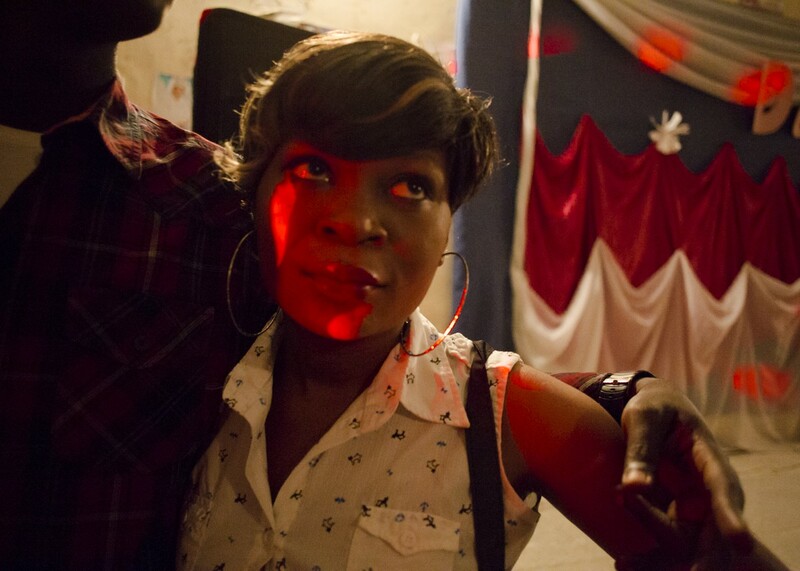 L-R: Janet, 24, in her room in the girls hostels. 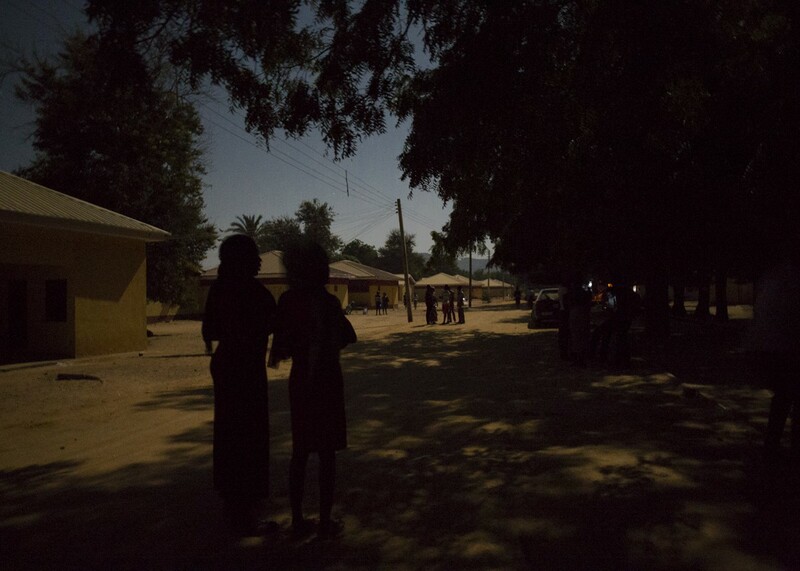 Students stroll in the evenings outside the girls hostels of Adamawa State University, Mubi, Nigeria, 2015. Four days after the Exodus, Janet, 24, a final year Political Science student, hair wild, feet swollen and bleeding, limped and stumbled into her Aunt's home in Yola. She had walked over 40km from Mubi to a small village where she hitched a ride to Yola. Her fatigued body had to be carried into the house. 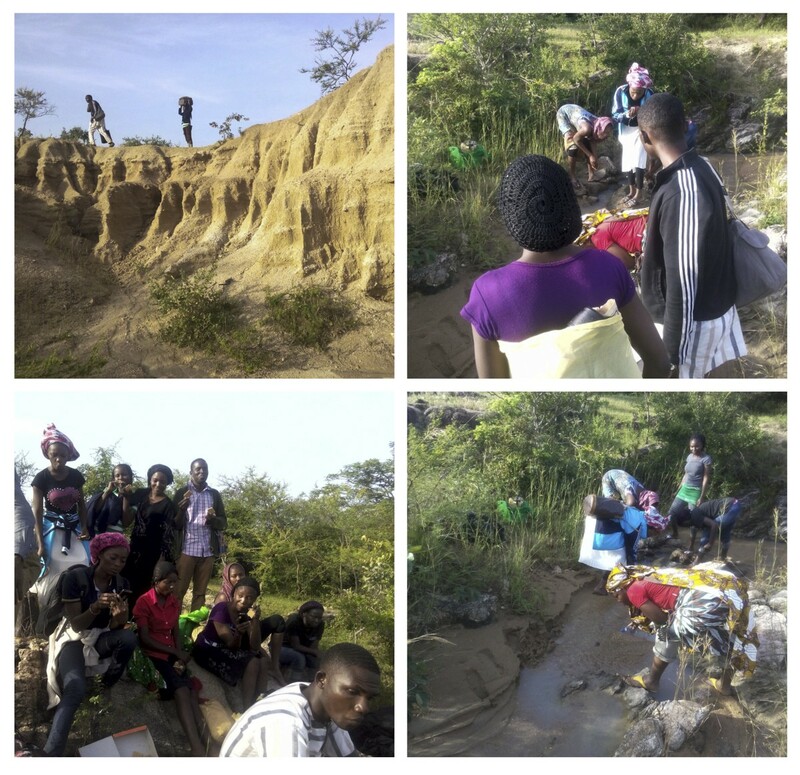 She showed me photographs on her smart phone of confused looking classmates trying to draw water from muddy streams and hiking through the mountainous terrain of northern Adamawa. “We started trekking, not knowing where we were going, but we were just moving,” said Janet. It was harvest period just after the rainy season so they scavenged on groundnuts and sugarcane in the abandoned farmlands they passed. “I wasn’t feeling that I would die, all I was thinking about was school. I did not have my certificate, I did not have my transcript, how will I start again from part one?” she said, remembering how distraught she was. Photos taken by Janet on her mobile phone during her escape from Mubi, Nigeria, 2014. Many students that day prioritised their certificates and school documents, over their electronics and clothing, in some cases, above their safety. This is because a certificate of Higher education in Nigeria is still a privilege for students who manage to overcome the many obstacles it takes to get to university. The “six-three-three-four” system which refers to the number of years students spend in each level of education, six in primary, three in junior secondary, another three in senior secondary and four years in university, has been plagued by infrastructural decay, corruption and frequent strikes by teaching staff demanding for the payment of salaries owed to them by the government. These issues have added years to each level of the sector altering original certificates, seen as ordinary pieces of paper in other parts of the world where archives have transitioned safely into the digital age, into valuable proof that you went through the Nigerian educational system. So when chaos ensued on campus, the first thing students reached for was their certificates and transcripts. Just the thought of the trouble it would take to replace these certificates was unbearable for Janet, Glory, Winnie and fatally for her brother Labaga. His certificate was so important that he ultimately risked his life for it. 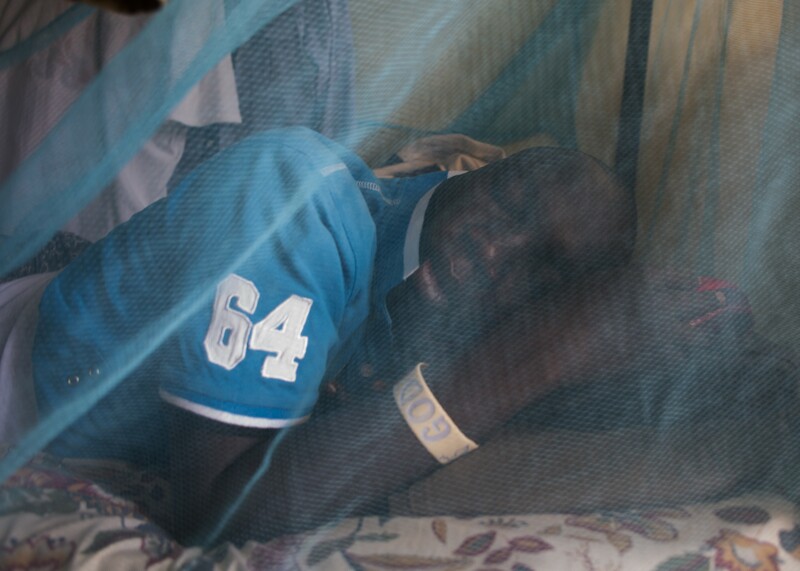 Shadrach,24, in his room in the boys hostel, Mubi, Nigeria, 2015. “We hope we can forget what happened,” said Shadrach, 24, who returned to the university after a nine moth closure to complete his final year of Public administration. Shadrach returned to the university because he couldn’t imagine starting afresh when he was so close to graduating. He explained it this way, he would rather take the risk of another Boko Haram attack than spend more years than he needed to enrolled in a new institution. Shadrach’s earliest memories of navigating the Nigerian educational system were tainted with violence. He remembers deadly riots when he was in primary school in Yola. During his secondary school years, he was caught up in the 1999 Jos crisis, where clashes between Muslims and Christians left hundreds dead. Students in north eastern Nigeria, are caught in extraordinary times, when the pressures of being young and attaining an education have been heightened by the Boko Haram conflict. Students returning to school for a sense of continuity and normalcy still feel unsafe and many remain traumatised by their experiences. They return to institutions where inadequate safety measures have not been put in place and many teachers have not returned. The physical structures themselves are in bad need of rehabilitation and many state institutions are waiting on government funding to repair damages. Students napping during the day in the student hostels, Mubi, Nigeria, 2015. In a Brutalist designed building where Adamawa state university administrators worked called the “Senate Chambers”, I spoke to Moses Zaruwa, the Vice Chancellor of the University. He spoke with the type of retrospective regret that only someone at the centre of the events of the 29th could. He believed that the suffering of the students could have been avoided if the school faculty had been better prepared in their response to get students out of the town safely. On the evening of October 28, 2014 he was at home with his family when he received a phone call informing him that the military was retreating from an army base thirty-five minutes away from the town and that insurgents were heading to Mubi. At 6.15am, after a restless night, he got a phone call by a security contact to get out of town. It took him a few seconds to digest the gravity of the situation. The fact that he and his family, the university community and the townspeople were completely defenceless against Boko Haram. He immediately began the tenuous process of calling his colleagues one by one to prepare for a mass evacuation of students. The university didn’t have a radio system or any efficient means to warn students simultaneously. 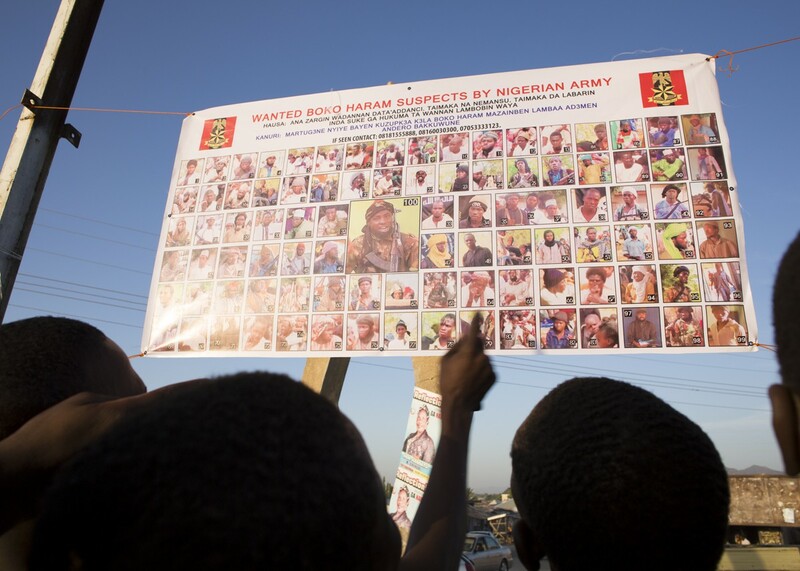 People gathered around a poster in Mubi town center, issued by the Nigerian Military to encourage citizens to turn in known Boko Haram members to the authorities. Mubi, Nigeria, 2015. 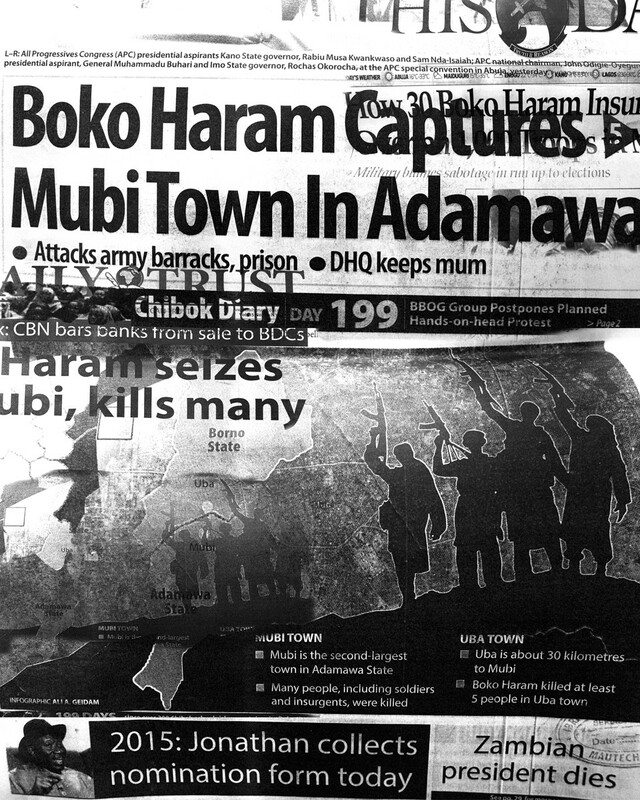 A collage of the front pages of Nigerian newspapers after Mubi was attacked by Boko Haram, Mubi, 2014. Abubakar, 22, a final year student of Public Administration, remembers seeing Zaruwa rush into the boy’s hostel telling them to leave the school premises. School buses were available to evacuate students, but by then it was too risky to drive on the road and the crowded buses had to return to the university. Zaruwa could not have anticipated how fast the situation became dangerous. After doing all he could to warn his students and faculty, he left the campus at 10.30am in his jeep, meandering through the bushes to Yola. Nine-months later, he was one of the first to return to the campus to find classrooms and student hostels ransacked. The university chapel and senate chambers were burned and vandalised. 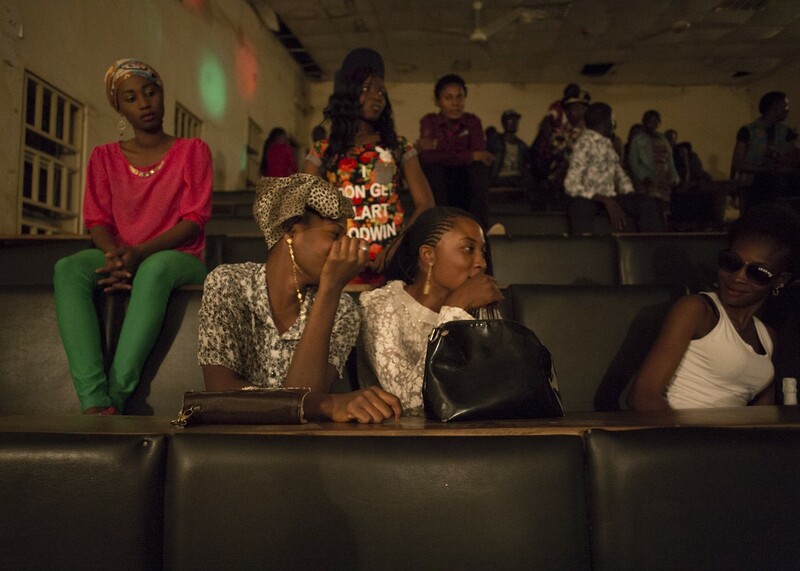 “After we came back, some students on the spark of a rumour of Boko Haram leave town. I don’t blame them. I feel sorry for them,” said Zaruwa, who admitted that a lot more need to be done to soften the fears of a university community who were still jumpy. He saw the need to create a sense of safety for returnees. Vigilantes, local hunters with combat experience, were recruited to guard the gates and there was a ban on yellow tricycles from entering campus. Still, this wasn’t enough to allay fears. 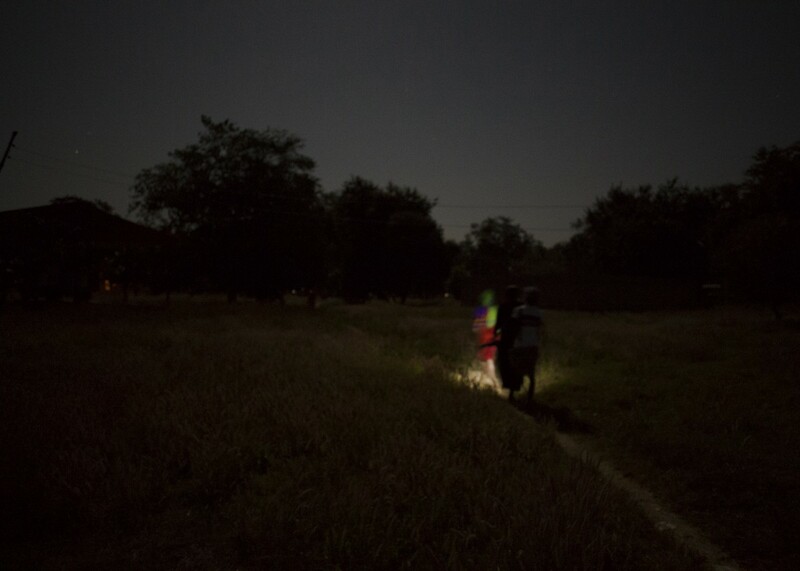 Students cross the Adamawa State University Campus at night. 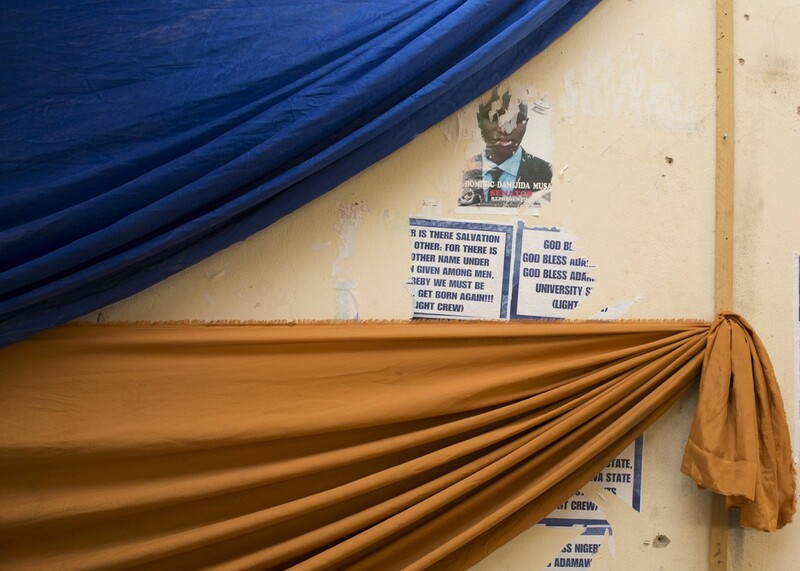 Old student election posters, Mubi, Nigeria, 2015. Many professors decided against returning to the university, and if they did, they relocated their families to safer areas in the country. “The insurgency is not going to be forever and the government have given me courage,” said Zaruwa referring to the national elections where President Muhammadu Buhari was voted in on the promise that he would end the fighting. His words revealed an ingrained optimism that the university community would heal with time. In a report published by the Adamawa state Ministry of Higher Education, assessing “the damage caused by the insurgency” released in January 2015, the estimated cost of damage on the university was set at five hundred and forty million Naira. On the list for proposed repairs were broken windows, damaged portraits of past VCs, missing laptops, and “structural defects" of the Senate Chamber. On the fourth page of the report, on a table titled “Estimated compensation for lives lost in the university” was Winnie's younger brother, Labaga. He was number five out of eleven "lives lost" on the list. His name misspelled with a “Y”. His “value for compensation” was two and a half million Naira. 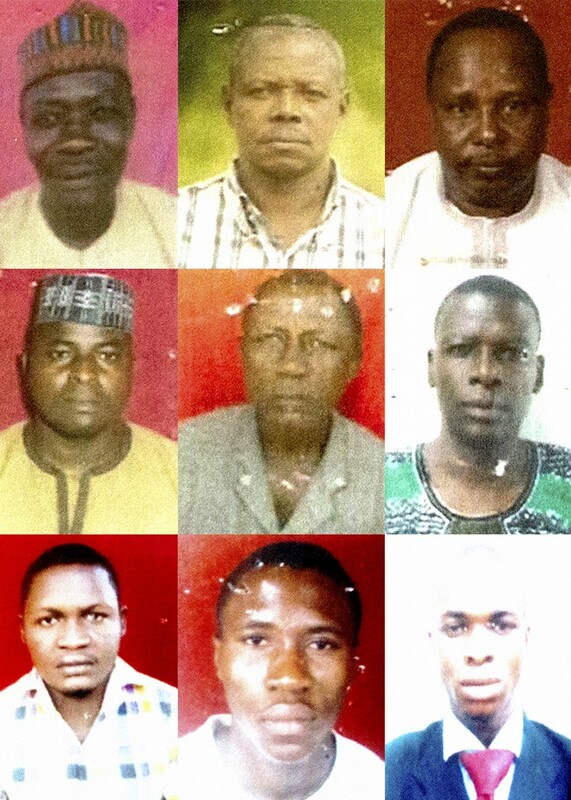 File images of some student and staff from Adamawa State University and Adamawa Polytechnic who lost their lives during or after the Boko Haram attack on October 29, 2014. Mubi, Nigeria, 2015. Labaga was born on a Friday, November 18, 1988 in Yola. He was born four years after Winnie, the only boy in a string of girls. “Labros mummy’s boy” was the nickname Winnie and his sisters gave him. He was a quiet person, the type that would stay away from noisy groups but always, somehow, surrounded by friends. He was weeks away from his twenty eighth birthday when he went missing on October 29, 2014. He is now assumed to be one of three Adamawa State University students that died either during the exodus or sometime after. A year later, Winnie puts up a cheery face when she talks about Labaga, but the smiles are not enough to distract from the tears glinting in her eyes. “My life is not sweet anymore because Labaga is the only one that would check on me on campus,” she said. She imagines that if he were still alive, he would be busy with his studies in the final year of completing his Economics degree. In between lectures, church and writing her final paper, Winnie doesn’t leave room for much else. Being much older than most of her student peers, she has an air of maturity that stands out in a pool of twenty somethings enjoying their last days of carefree youth on the university campus. Winnie in the girls hostels of Adamawa State University. Mubi, Nigeria, 2015. Old photographs of Labaga in his family album, Adamawa State University. Mubi, Nigeria, 2015. 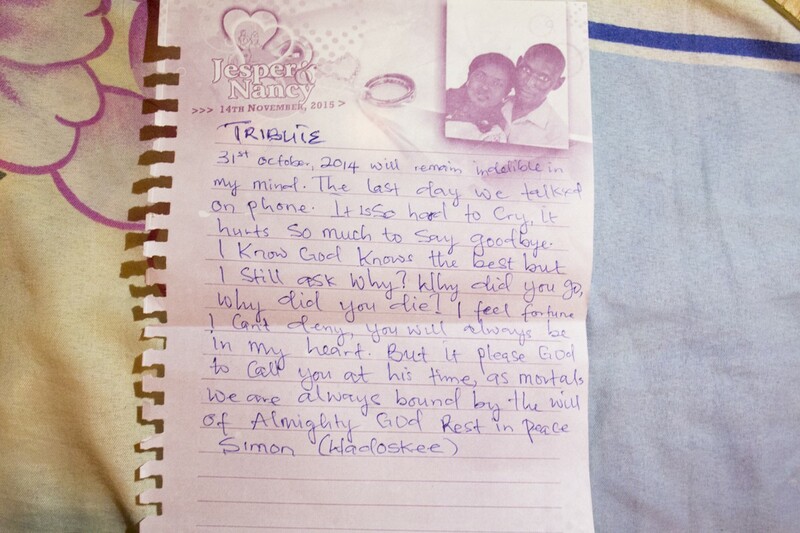 A tribute letter in memory of Labaga written by a friend. Mubi, Nigeria, 2015. Over the years, as security concerns on campus increased with the conflict, there was a significant quieting down of student life. Youth culture at the university had always been quite conservative, with many listing worship as a hobby. Still, students always found a way to express their newly found freedoms living away from home for the first time. The university had banned most social events when threats of violence from the insurgent group became hard to ignore. Despite this, I spotted a rare gem, a colourful poster promoting the annual campus variety night and student social. Students at the Adamawa State University Variety night. 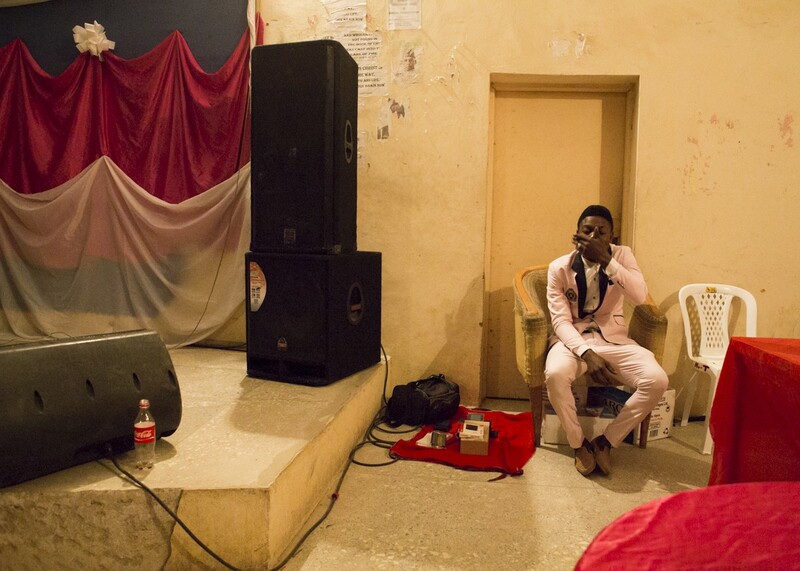 Mubi, Nigeria, 2015.
Who knew that a lecture hall designed for three hundred students studying Political Science and Economics by day, was perfect for the purposes of entertainment by night. Rhythmic red and blue neon lights reflected on the worn black leather seats that on a normal day held hundreds of students. The acoustics in the hall was also perfect for the Nigerian pop tunes emitting from the sound system. Soon the energy in the hall was electric, packed to full capacity with students cheering for the best singers, rappers, and dancers the university had to offer. “Prior to the insurgency there were events every week, but since the insurgency we have not been able to organize many events,” said Vandi, a final year Political Science student and aspiring rapper. He organised the event in an attempt to revive social activities on campus. “Students and the school management are scared of a large crowd,” he said describing the air of apprehension that surrounded the event. 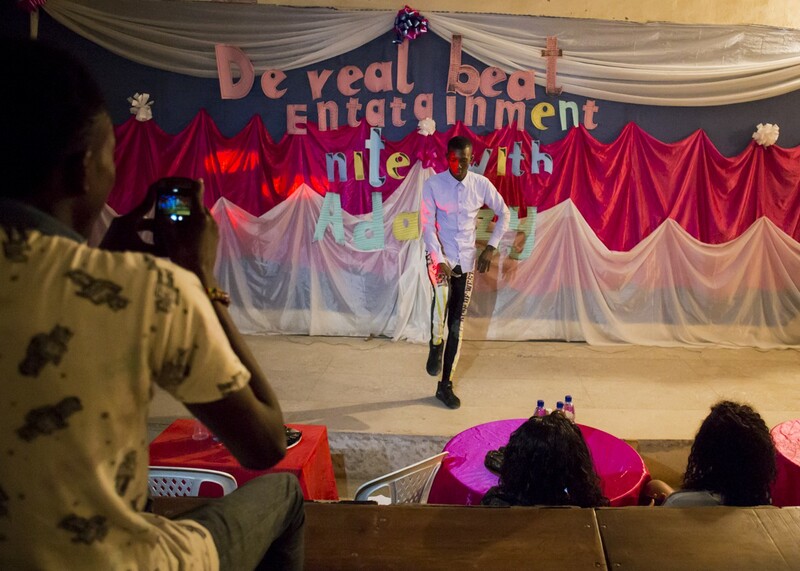 During the nine-month closure after the Exodus, Vandi thought of re-enrolling in another university or the option of pursuing his dream to become a rapper in the Nigerian entertainment scene. But like many of his peers, especially final year students, he decided to return to the university where the students were jaded by their newly acquired knowledge about life. They had learned how quickly their day dreams of eternal youth could turn into a nightmare. “It has been long since students have experienced a night like this,” said Vandi.